Windstream is a broadband Internet provider that was founded in 2006. They offer services to homes and businesses in the United States, and also offer phone and digital TV services as well. They operate in 21 states across the country, and serve eight million people total. One of the most underserved areas of the United States by the Internet service industry is the southeastern part of the country. That is the focus for Windstream, where they offer basic DSL Internet out of Little Rock, Arkansas. Their plans range from a very stripped down 6 Mbps plan, to a surprisingly modern 25 Mbps plan. 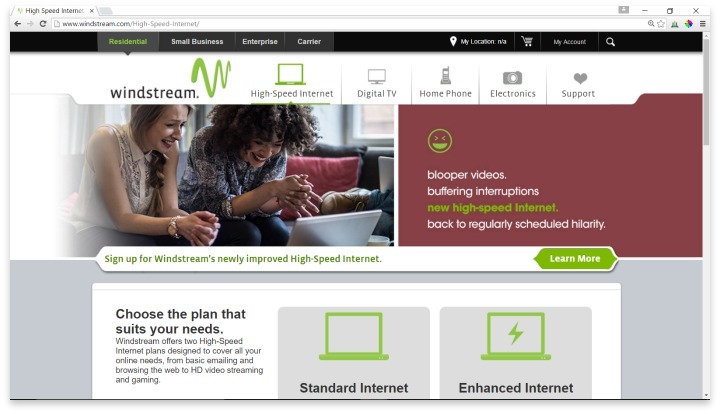 At this top level plan, Windstream’s speed is adequate for streaming and light gaming. In 2014, Windstream was subjected to heavy fines from the Georgia GOCP, after it was revealed that their advertised speeds were not being delivered. Shortly after this, a new CEO was named, but no third party investigations have taken place to ensure that Windstream has improved their practices. The failure in speeds were due largely to outdated copper wiring, and there has indeed been proof that Windstream has been updating their infrastructure consistently since then. Unfortunately, most of the extras that would come for free with competitors’ services, like security and data backup, cost extra through Windstream. Any kind of spam protection or antispyware must be purchased apart from the provision package. Windstream’s customer service is available on social media platforms, and through the basic phone, email, and chat options. They also include a variety of video tutorials and FAQ pages for DIY customer service, if you prefer that method. Customer reviews across a wide variety of sources almost unanimously paint Windstream as having poorer than usual customer service, but a large percentage of those reviews came in light of the 2014 lawsuit in Georgia. Since those fines, and the appointment of a new CEO, reviews have mellowed. Windstream does not require contracts, which is a major plus for any Internet provider, and they provide a variety of methods for paying, including in-person locations at many popular stores. Additionally, Windstream doesn’t cap data on any of its plans, or reduce speeds when certain levels of data usage have been reached. These are practices that have made it very hard for consumers to afford Internet services in the past, so the fact that Windstream avoids them is a positive. Windstream focuses on southeastern United States for DSL Internet with a money back guarantee and no contracts. All in all, it’s hard to say if Windstream is a worthwhile service provider. Their history would suggest that it would be better to find another service, but that is easier said than done for many. The good news is that you aren’t locked in to a contract should Windstream turn out to be disappointing. If you are in an area where Windstream operates, it won’t hurt to give them a try. They even offer a money-back guarantee for 30 days so that you can get a refund if you can tell right away that the service isn’t what you need. Windstream customers can bundle their Internet service with Dish TV and a home phone line if they prefer, and can skip the $35 installation fee by following the simple instructions for self-installation. However, if you have access to a more trustworthy service, it would probably be better to skip Windstream. Have you had an experience with this company? Please share your Windstream reviews below.